You need to be a Seeker of Jacob Boehme to add comments! Hi, wondering if anyone has entertained theories as to who Jakob was in other lifetimes. I see a continuity of soul in Hildegard of Bingen before him, and Jane Ward Leade and Vladimir Soloviev after. Thanks for posting this response! I am an Entheogenic Enthusiast, and after seeing this drawing on the cover of the book The Apples of Apollo, and reading an explanation of the symbols, I had a poster copied from the cover and framed. It hangs next to my votive table at home. 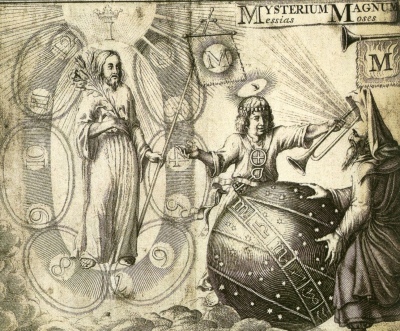 Just what Jacob knew about mushrooms, and how Entheogenic Experience could be related to his symbolizing of the Triune Godhead is fertile ground for speculation. The 'Father' hyposthesis seems to resemble mushroom primordia and mycelium. The 'Son' looks like a mature carpophore (fruiting body), which in nature emerges from the mycelial 'mass' underground (unmanifest to perception). In Mesoamerica, one of the names for Psilocybin species mushrooms is Teonanacatyl - 'flesh of God[s].' As anyone who has taken the 'Little Ones' Knows, communion with God is a possibility. The Amanita varieties have their own modern advocates, and certain frescos and mosaics of antiquity (see Franco Fabbro's work) illustrate that early Christians may have utilized Amanitas (and snails, which ate and detoxified the 'shrooms, after which the snails were consumed). This particular contribution of Boehme opens a door into a completely different realm than the pure mysticism of theological construction. Here, nature has contributed a magickal or shamanic element which harkens back to The Mysteries of Eleusis. Are there any books which describe exactly how Boehme attained his visionary states? Were they spontanious or did he have a method? Yes, it is Christian Cabala, you should start with Reuchin, he sent a letter to the Pope explaining how the Catholic faith was destroying all the real truth of the scriptures in relation to Kabalah, it was also published all throughout Europe! Johann Reuchlin (January 29, 1455 – June 30, 1522) was a German humanist and a scholar of Greek and Hebrew. For much of his life, he was the real centre of all Greek and Hebrew teaching in Germany. Paracelsus (born Phillippus Aureolus Theophrastus Bombastus von Hohenheim, 11 November or 17 December 1493 in Einsiedeln – 24 September 1541 in Salzburg) was a Renaissance physician, botanist, alchemist, astrologer, and general occultis. Cannot remember off hand but there is one Generation I am missing in between here. Jakob Böhme (April 24, 1575 – November 17, 1624) was a German Christian mystic and theologian. He is considered an original thinker within the Lutheran tradition. You can call it the Lutheran Reformation or the Protestant Reformation, they are really one in the same movement, notice their Banner! so I've been wondering for a while now: which came first for Boehme? an understanding of the Kabbalah or his vision of the Tsim Tsum? Obviously the constriction has been around in mystical philosophy since Luria at least but my question is did Boehme come to this independently? you know I thought I got that today at a used bookstore but I picked up Jacob Boheme His Life and Thought by mistake, I still expect it will be a good read though.